At Winter NAMM show 2012, Anaheim, CA, Avid announced the Venue SC48 Remote System, a compact digital live sound system that delivers sound quality, Pro Tools integration, and direct plug-in support of the Venue SC48, now with remote I/O functionality for increased flexibility. 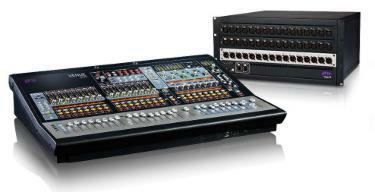 Consisting of the SC48 console (which was launched in 2009) and new Venue Stage 48 remote box, Ethernet Snake Card, and Venue 3 software, the SC48 Remote System is an alternative to the all-in-one SC48, enabling engineers to place the I/O away from the console and closer to sources. And with fully redundant Ethernet AVB snake connectivity over inexpensive, lightweight Cat6 cable, engineers get reliability without bulky cable clutter. Features of the Venue SC48 remote system include extensive connection versatility, with 48 inputs and 16 outputs (expandable to 32), customizable between SC48 and up to two Stage 48 remote boxes; highly reliable transmission through low-latency, open standard Ethernet AVB delivering fully redundant all-digital connections through standard Cat6 cable at distances up to 100 meters; record and play back of up to 32 channels in Pro Tools with just a FireWire-equipped laptop; and compatibility of show files created on any Venue live sound system for full show file portability. The Venue 3 software upgrade offers new features, including faster workflows to significantly speed up all aspects of mixing. SC48 users will especially benefit, as the software upgrade provides more busses, input processing channels, plug-in slots, and Pro Tools channels than ever.The Console User button in the Events List can be programmed to perform common tasks such as tap tempo or recalling a snapshot.